Meet the Unbelievable Mega Scale Teardrop Called Aero Madera Called ‘Flying Wood’. Never Lose Your Keys or Smartphone Again When You Use a PuGoo Pad. 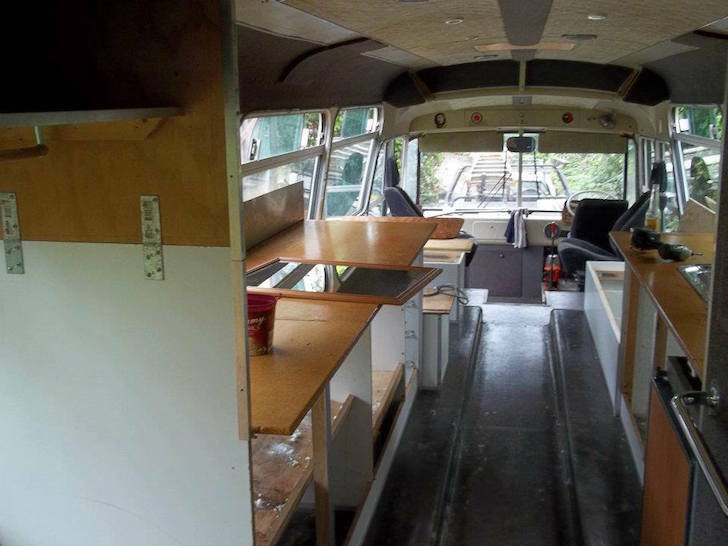 This bus renovation started out simple, then they took it down to bare metal. 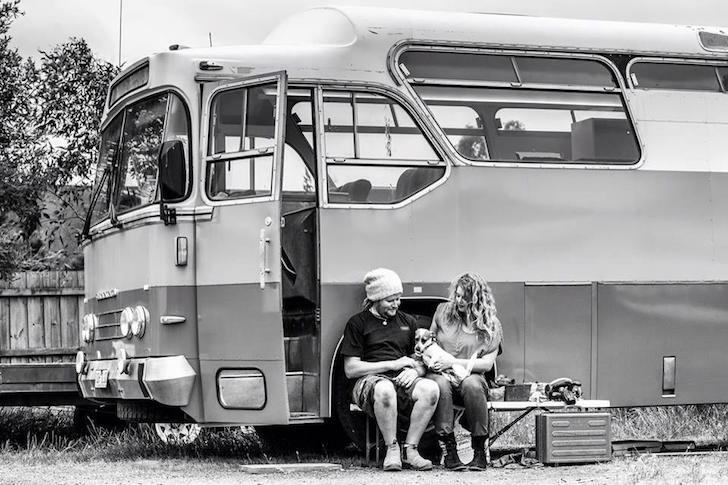 Two Aussies fall in love, dive head first into a bus renovation and take their life on the road. 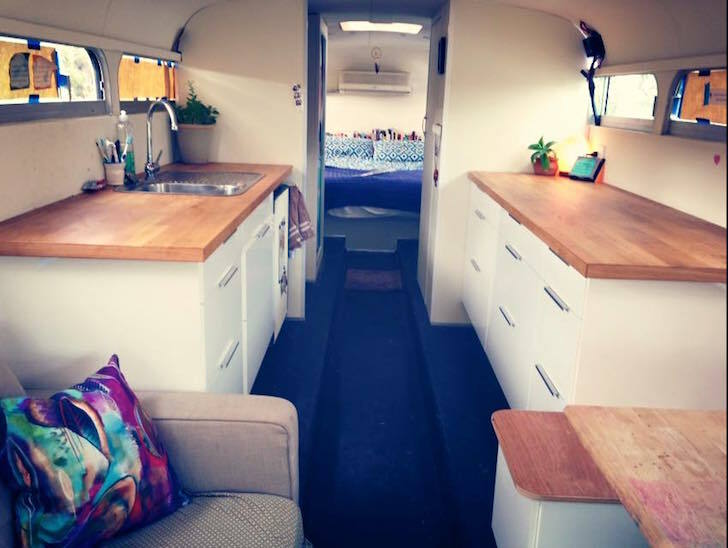 Luckily for us, Alyce and Paul kept a photo record of their bus conversion journey. 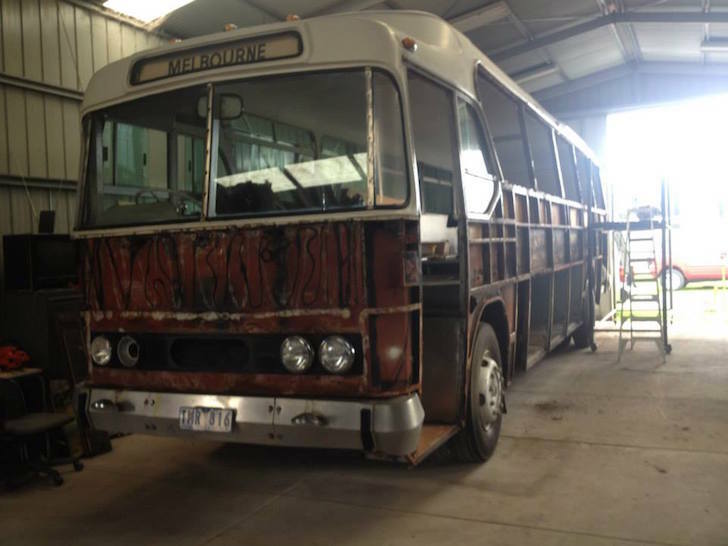 Alyce spent her late growing-up years on a farm with her mother, who traded cows to get this great bus for Alyce. Alyce and Paul met when he came to the farm to help with a plumbing problem. 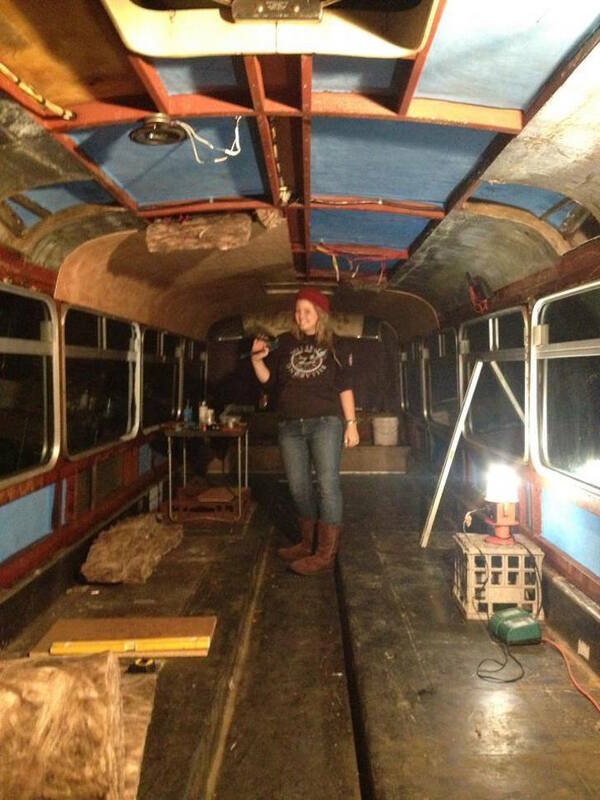 Three years later, Paul looked her up and the rest is bus renovation history! The “Blue” Bus before the renovation. 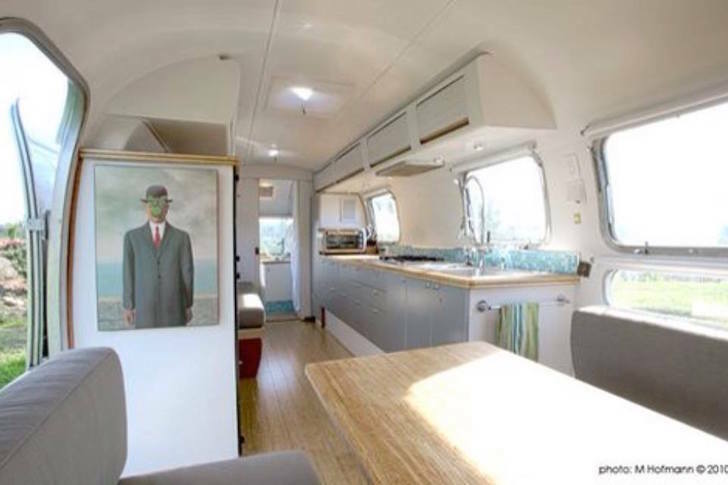 The interior of the bus was livable, but dated. Alyce and Paul wanted to create a space to their liking, so they decided it would be best if they started over. Alyce was determined that she and Paul would have space to raise children on the road. They also wanted to customize the design to their liking. 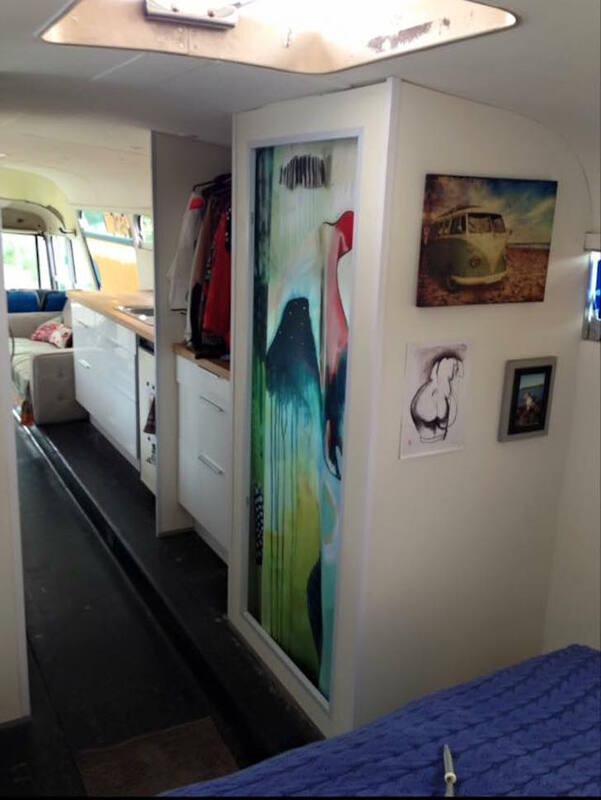 She picked an inspirational image of an open, airy bus interior and they got to work! 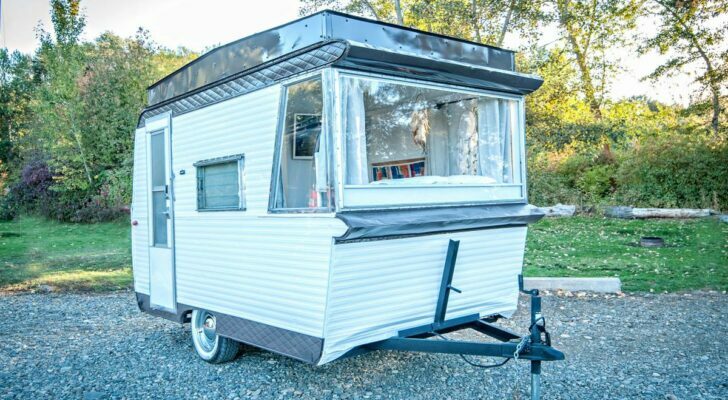 The inspiration for their bus renovation. Tearing out the old fixtures. 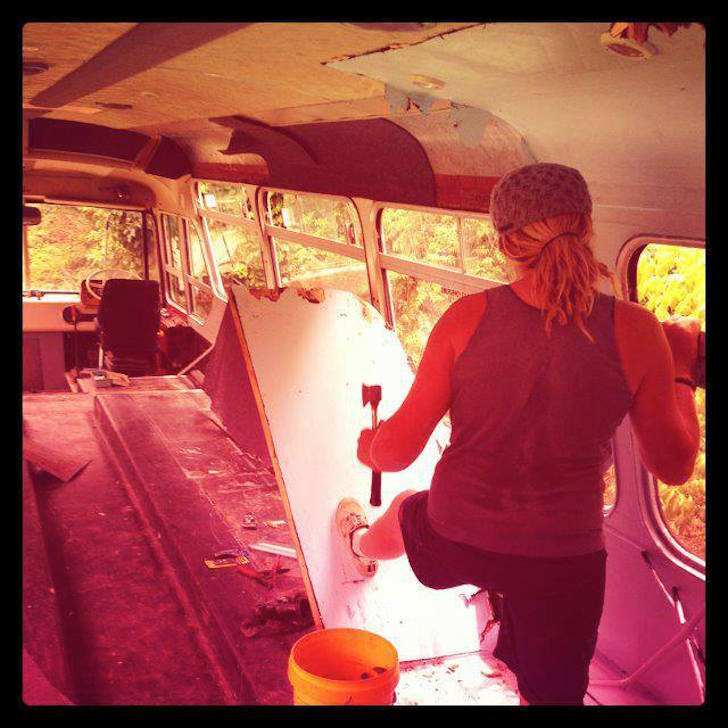 Here’s Alyce enjoying a little “demolition therapy” on the way to the bus’s new interior. They tore out all of the bus’s fixtures, opting not to salvage anything. Interior with most of the ceiling panels down. 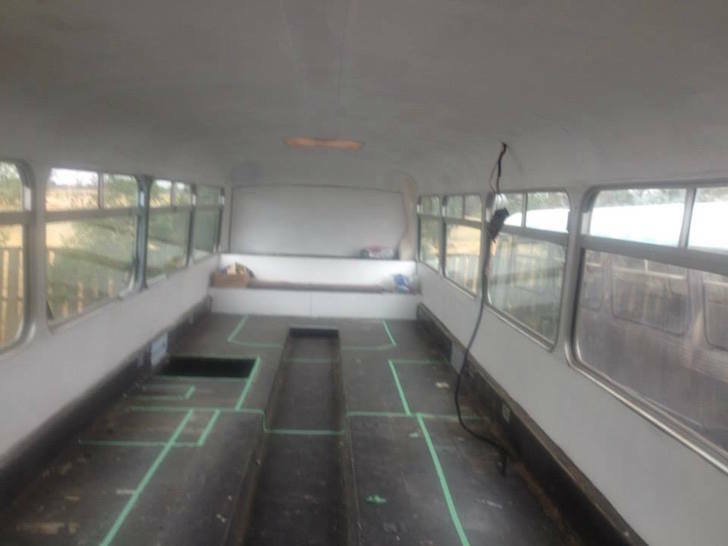 Ever wondered what the roof frame of a bus looks like? Here it is. Plywood panels on a wood frame, with insulation sandwiched below the roof’s steel girders. 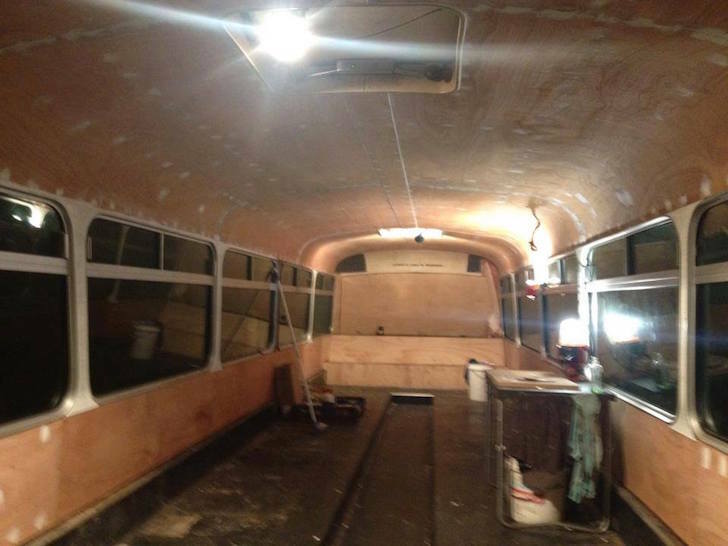 They also removed the bus’s old electrical system and ran all new wiring! New ceiling panels in. Holes filled and sanded. 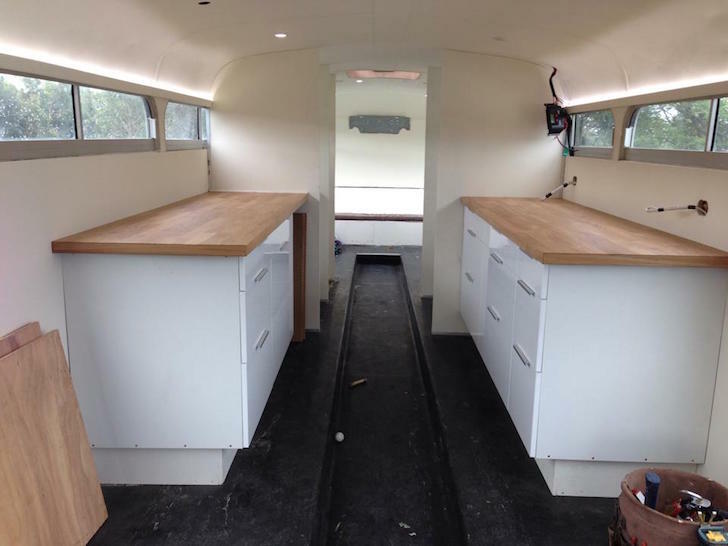 Here is the interior with new paneling in place and ready for paint! Primer coat in place and fixture positions taped out on the floor. 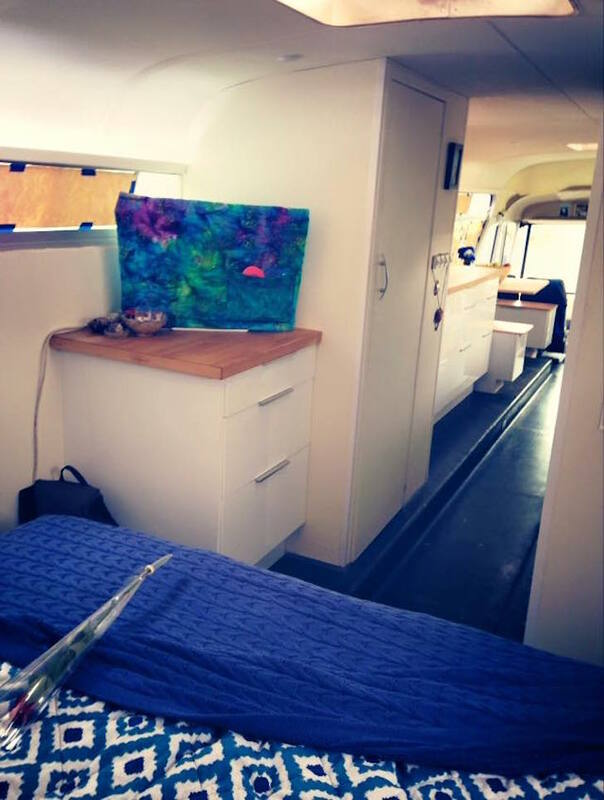 Alyce studied color psychology for hours, thinking about the best way to achieve a spacious feel. She landed on white. Here are the new panels with white paint in place. Notice the tape on the floor, marking the locations for the new kitchen, bath and closet. When Paul started on the exterior, they found the frame coated in rust. Just when it seemed like the renovation was going along great, they made a horrifying discovery. 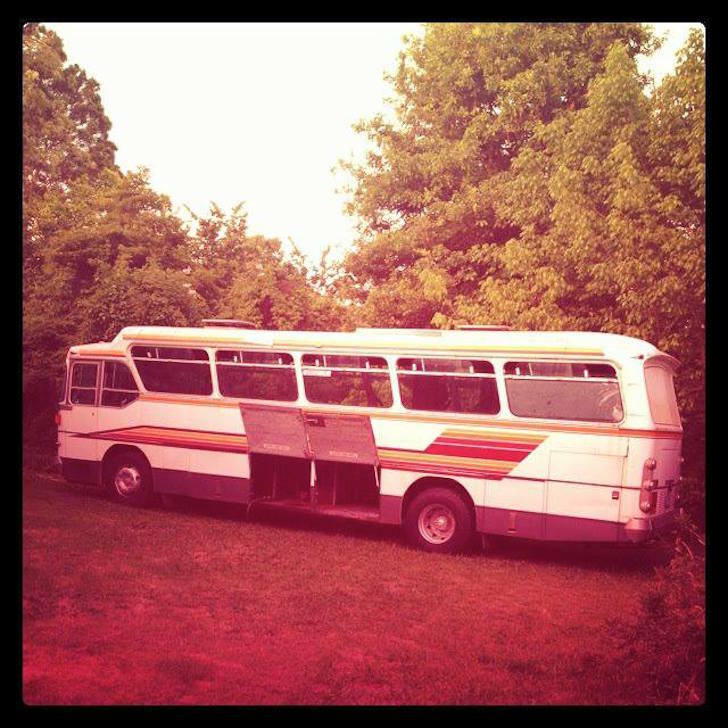 Their bus’s frame had cancer in the form of destructive rust. They would have to cut pieces of framing out and replace them to prevent the spread and eventual collapse of the bus’s skeleton. A rusted frame is one of the hazards of renovating a vintage bus. 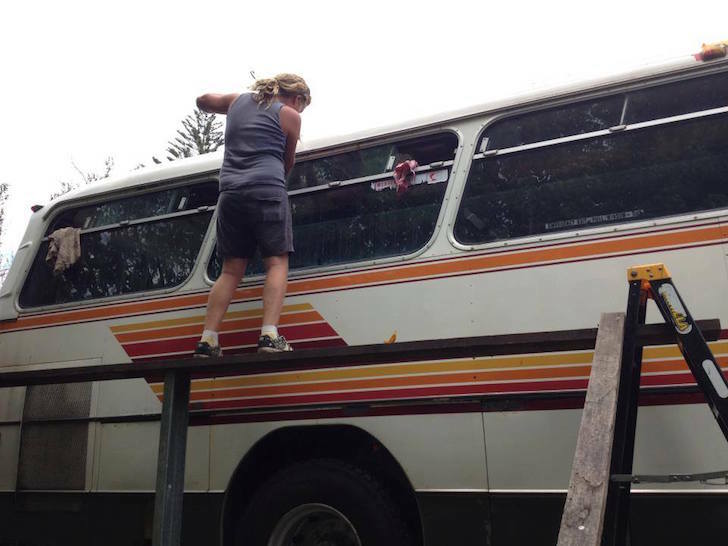 All of the bus’s steel panels had to come off to repair the frame. The frame before welding in new steel and after rust resistant paint. Determined to prevent the rust from reoccurring, they opted for a coat of rust-proof paint to prime the newly repaired frame. They were aided in the extensive cutting and welding by a professional welder friend. 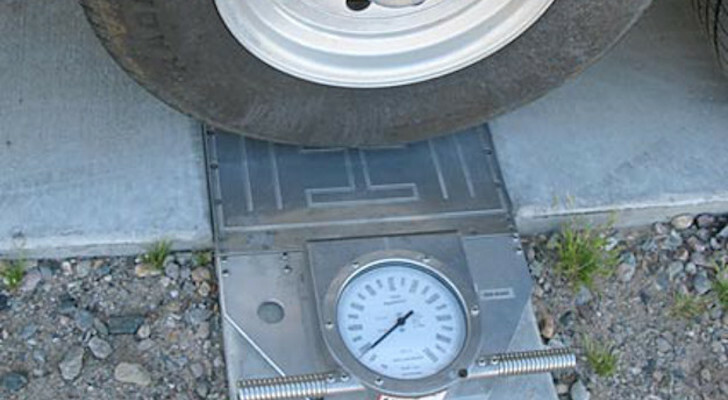 Doing it right is the key to a quality bus renovation. New insulation and panel adhesive. 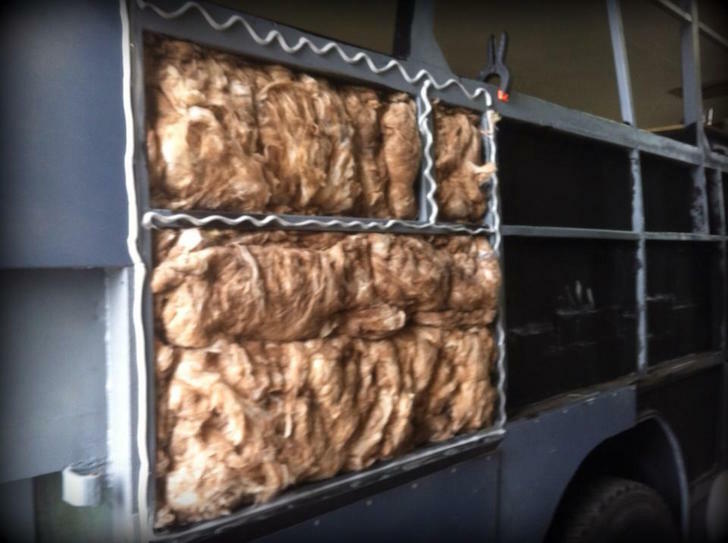 Insulation under the bus’s skin serves two purposes. 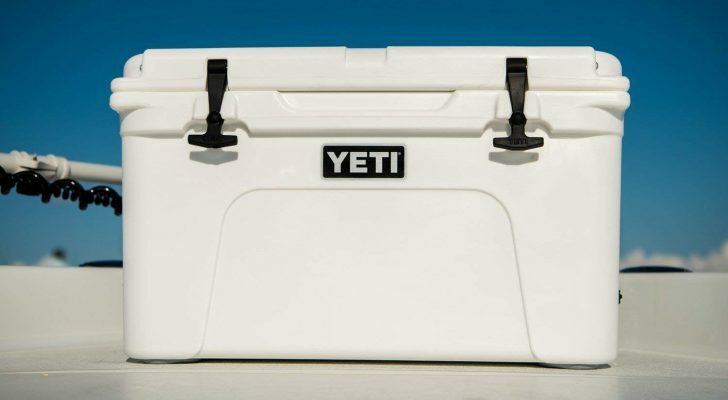 First, it makes the interior more comfortable in hot or cool weather. Second, it helps to deaden road noise, which can be quite irritating in a large bus. 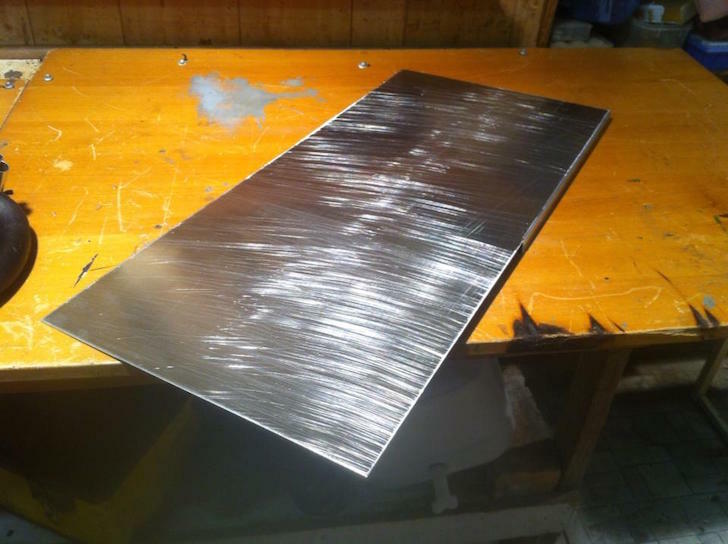 Aluminum panels won out over steel as they won’t rust. 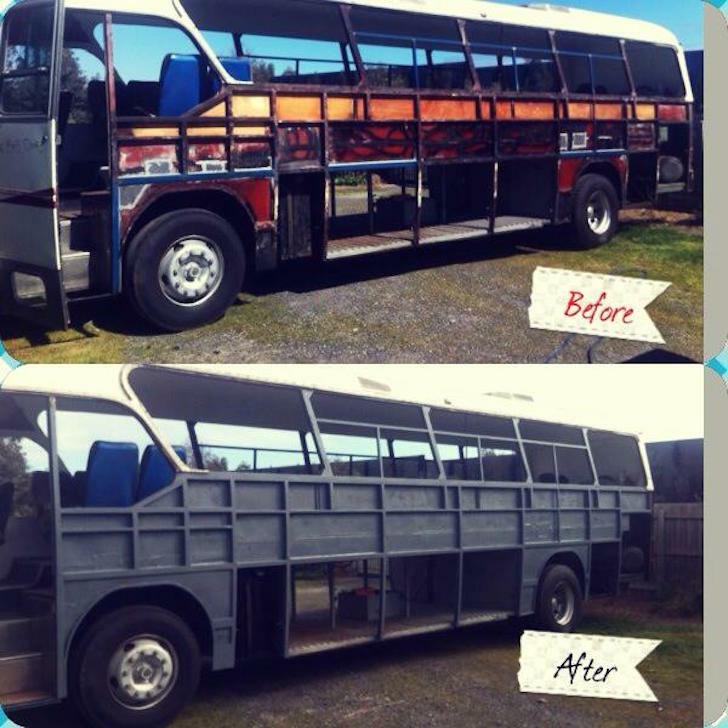 After going to the trouble of replacing rusted frame sections, Paul and Alyce chose to accept the added expense of new aluminum panels to replace the old steel ones, making their bus more resistant to rust. 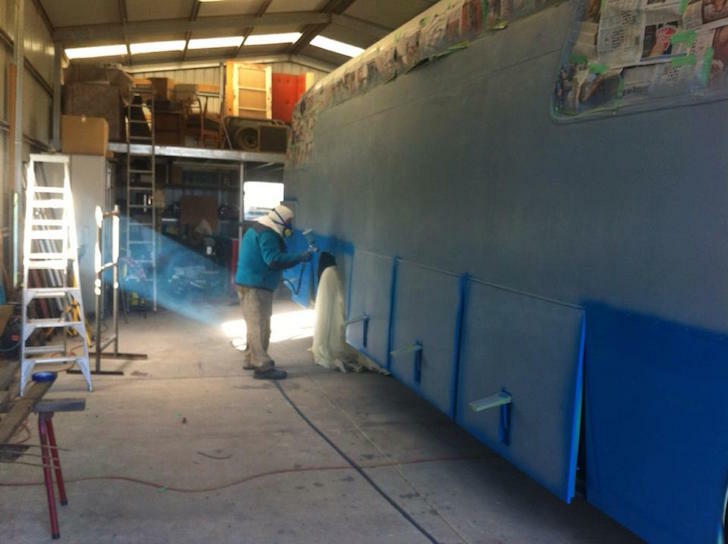 Each panel had to be custom cut to fit a specific section in the bus’s frame, then riveted in place. Paul’s dad offering expert help. They chose a color scheme reminiscent of the beach, with two tones of blue and a crisp white. Paul’s dad is a professional paint sprayer and, like good Dads everywhere, offered his services to make sure the bus looked its best! 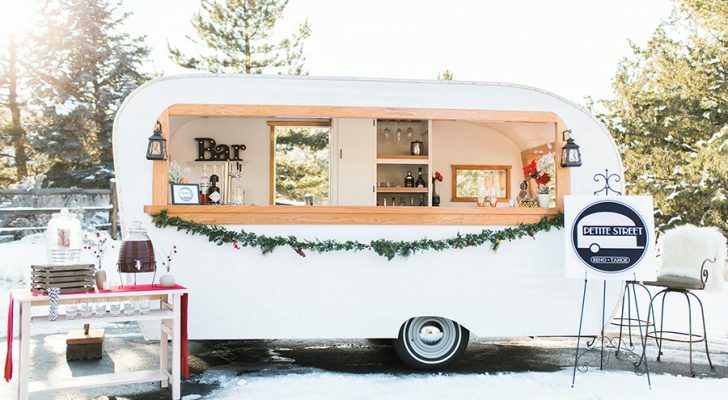 When they started looking for kitchen cabinets, they found that IKEA had units they liked – in the right sizes – and at a price they could still afford after replacing the exterior paneling. 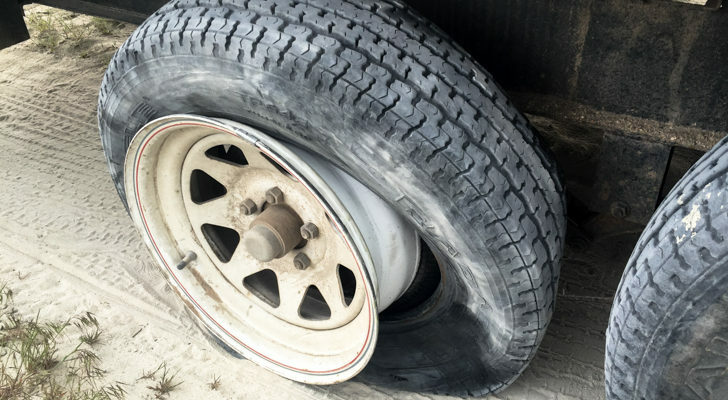 They took the extra precaution of reinforcing all joints to ensure the storage units would survive life on the road. Alyce working on the Mandala-inspired mosaic for the shower. 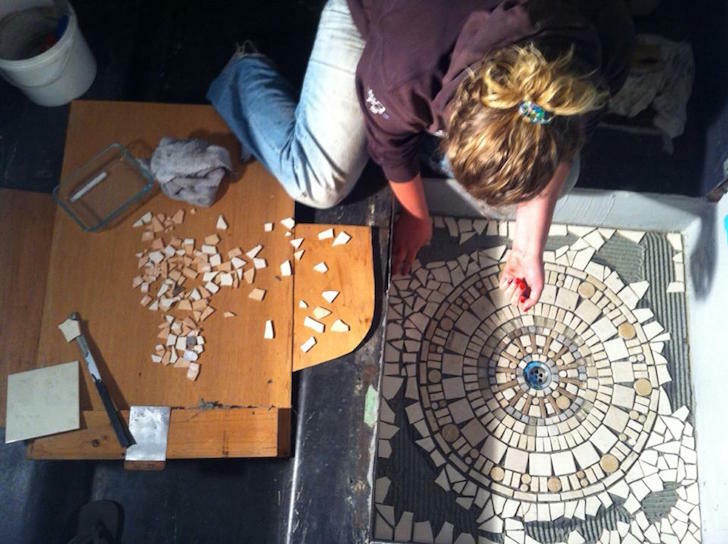 Alyce’s mother offered her artistic expertise in designing a mosaic mandala for the shower floor. Each tile piece was fitted by hand. The tile came from the discount and clearance sections of nearby retailers. New closet setup for Alyce’s extensive wardrobe. 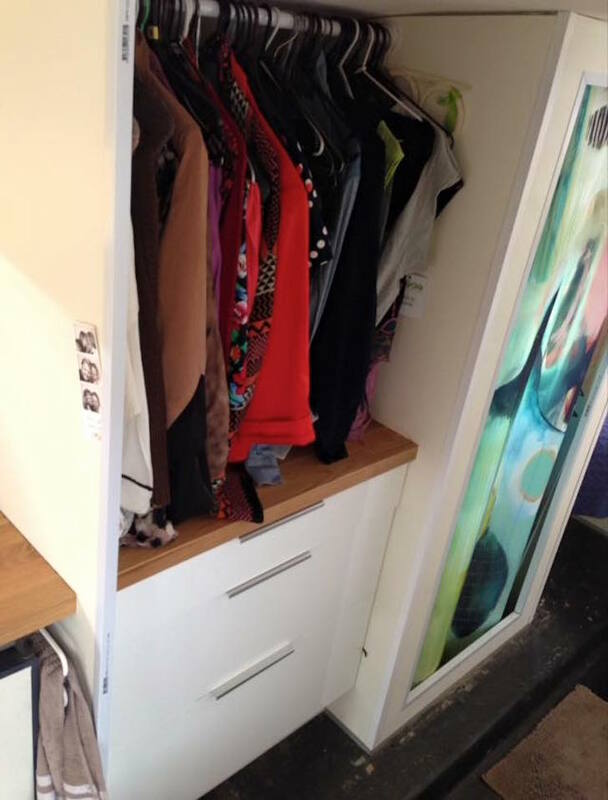 The plan included plenty of storage for Alyce’s large wardrobe. 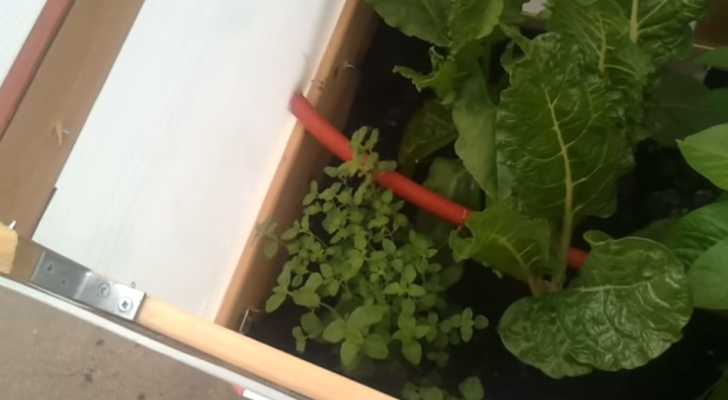 Storage is often a challenge in such small confines. 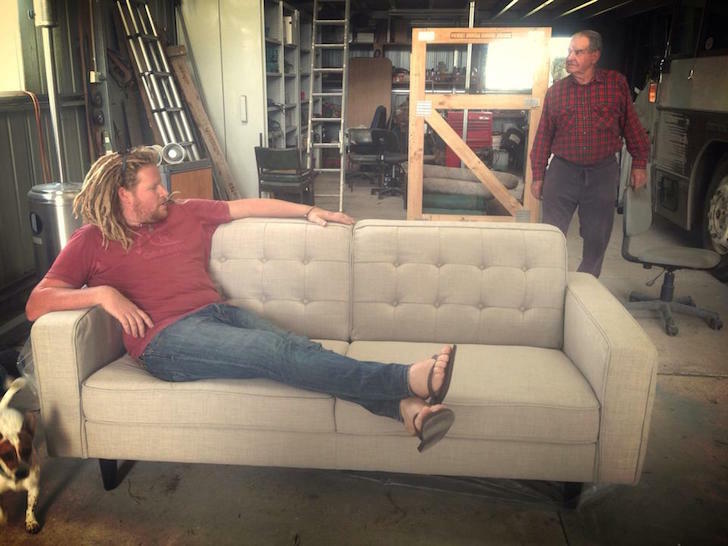 The search for the perfect sofa caused some drama, as it had to fit the space allotted, match their interior style, and still be long enough for someone to sleep on! They persevered though, and finally found one to their liking. At last – it’s finished! 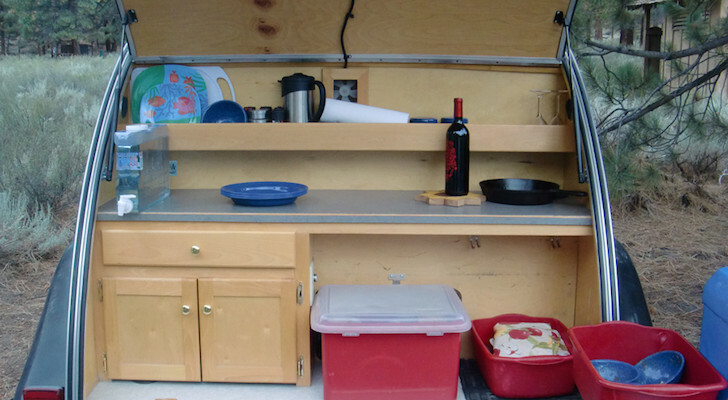 What Should You Pack In A Teardrop Trailer’s Galley Kitchen? 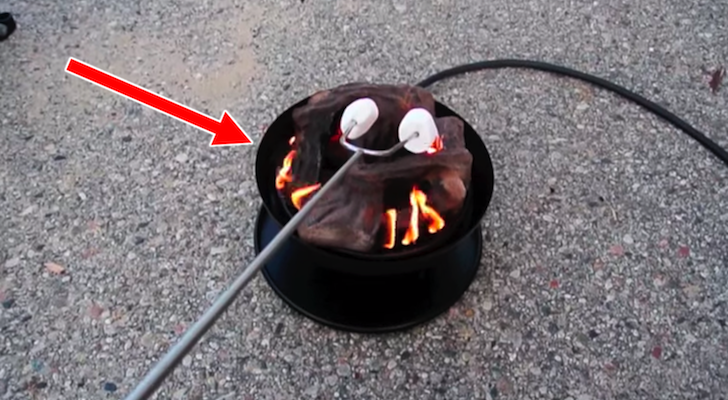 3 Portable Propane Outdoor Campfires. Ideal For Burn Ban Locations.